often wonder how these times will be remembered. What will future generations learn from this moment? Which stories will historians archive? What experiences will be forgotten? Watching the insanity of this election cycle has confirmed for me the importance of knowing histories; not just your own, but the distant and contemporary, local and international happenings that have shaped our present. The rhetoric employed by the extreme wings of the GOP has empowered and emboldened embarrassingly inaccurate and flatly supremacist depictions of American history. Slogans like “Make America Great Again” assume that the growth of America’s empire occurred without the toil of immigrants, people transported by force, or those who relocated in the hopes of accessing the freedoms of democracy. A recent poll released by Reuters revealed that 38% percent of American voters continue to support the GOP’s candidate despite his blatant disregard for anyone other than white men and general dismissal of fact-based platforms. I dare not try to understand the irrational reasoning of deplorables, but urge critical thinking voters to remember the whole and diverse contributions that sustain America. Lest we forget all those that came before us, live among us– the laboring bodies that support the world. The exhibition titled Lest We Forget curated by Deirdre Darden and Jarvis DuBois at Galerie Myrtis interrogates a legacy of historical cultural bias; the conceptions that determine a story’s archivism or omission from history. Artists Wesley Clark, Larry Cook, Shaunte Gates, Jamea Richmonds-Edwards, Amber Robles-Gordon, and Stan Squirewell, collectively known as Delusions of Grandeur, and Delita Martin all contribute their own reflections about forgotten experiences in order to build a richer, more inclusive, and more accurate vision of history. Art theory is often inscrutable, and it’s doubly so for abstract painting. That’s why the framing of the “Real Beauty” at Carroll Square Gallery needs to be taken with a grain of salt. “Abstraction is arguably the truest representation of how the world feels, though by definition it obscures how the world actually appears,” reads the exhibit’s wall-posted introduction. Is this genius or gobbledygook? It’s hard to tell. And most of the works—all of them abstractions, by four different artists—don't offer much help in sorting it out. Patchwork is the operative mode — and metaphor — in “#myDeanwood: Honoring the Past to Create the Future,” a survey of art chosen to reflect Northeast Washington. There are other media in this small show, but most of the pieces are assemblages. 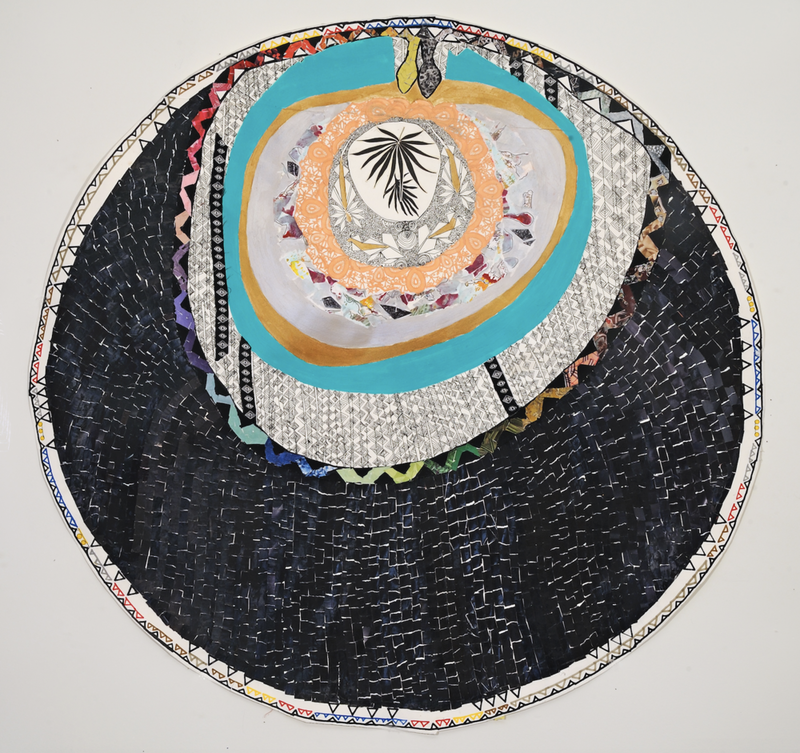 Journalist and artist Esther Iverem makes quilted collages with historical elements, both personal and cultural; she sometimes invokes Oya, the Yoruba spirit of communication with ancestors. Sherry Burton Ways’s dolls are constructed of sticks, fabric, paper and what appears to be human hair; mounted atop strips of patterned fabric, these totemic figures evoke layers of history. Most interesting is Amber Robles-Gordon’s “Matrixes of Transformation” series, which does indeed transform her colorful fabric combinations by photographing them. These 2-D images have a strong sense of depth, but by focusing on details, they offer a more direct way to see Robles-Gordon’s tangled work.